When computing decreasing powers of 10 there is a trick we can use to get the result without using division and without using any other registers. Here we use the familiar 8/10 * 2^32 constant for dividing by 10 with a multiply. But we throw away the result and only keep the "useless" low order bits. Well in this case the low order bits has our desired result once we halve it. ... BUT we can't encode that value directly as an immediate in x86-64. We either have to have a register with the value, or use a memory location. Note: That this is only valid for powers of 10. Other numbers probably don't work (I haven't investigated all the other number patterns). And especially the input value of 1 gives the wrong result. Anyhow, I found this useful in a number conversion function when I was short of registers. If you want to divide by the odd number, and you know the number you want to divide is divisible without remainder, you can do this by multiplying by "magic" number and take the LOW half of the result, without need to do any shifts etc. Let me explain how it applies to your case. 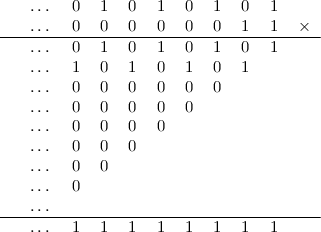 In the field of 2-adic numbers the representation of number 1/5 is an infinite sequence of digits: ...00110011001100110011001101.
if we group them in fours and convert to hexadecimal, this is: ...CCCCCCCCCD. Now, in general when you multiply any p-adic numbers, the low n digits of product only depend on the low n digits of factors. So if you only take low n digits of a rational number like 1/5 and multiply another number by it, the low n digits of the result are going to be exactly the same as in actual product of 1/5 and the other number. Therefore this method should always give a perfect result when the other number is divisible by 5, because then the result is an integer and everything above the low n digits is (in 2-adic case) an infinite sequence of 0s or 1s (depending whether the integer was positive or negative). The low digits of 2-adic representation of 9/5 do not resemble a small integer at all. I'm still trying to understand the whole 2-adic thing. The high-order bits I can understand how that works, but the low order bits ... they are still a mystery to me about what happens there. Let me try to explain it as simply as I can. For certain you are already familiar with positional numeral systems like decimal, binary, hexadecimal, etc. Normally this kind of infinite sum would be divergent. But when the base is a prime number, it is possible to define such function of distance between any two numbers (based on p-adic norm) that these sums become convergent (with p-adic norm the powers of p are closer and closer to zero the higher the exponent is). Since this only works for prime numbers, we use "p" to denote such base. So this is a representation of a negative number. In fact, all negative numbers are going to have representations that have all digits set to 1 starting at some point. (Note that the calculation we did would normally be invalid, but it is correct under a 2-adic metric, all these sums are convergent then). It is possible to add and subtract these numbers just like you would do it with finite ones (with carry), except that here you have to repeat carrying till infinity. If you add one to , the carry is going to repeat endlessly, leaving just zero digits behind. It confirms that this number is the same as minus one. This nicely relates to the two's complement interpretation of binary numbers in computer architectures. Any such number can be seen as a lowest n digits of a 2-adic number with assumption that all higher digits are the same as the highest digit (called "sign bit") of these n.
The two's complement arithmetic is a kind of projection of a more general 2-adic arithmetic, and this is what makes it work so well. This time we got a fractional number. This one turned out quite simple, because number 3 has just two bits set, so multiplication by 3 ends up being just a sum of a number and its copy multiplied by 2 (that is: shifted one digit to the left). And thus we have verified that the representation of multiplied by 3 indeed gives -1 as a result. I encourage to play with this a little, for example subtract from 0 to see what looks like and then multiply that by 3, which should result in plain 1. Looking at this long multiplication algorithm, we see that low n digits of result only depend on the low n bits of the factors. So, for example, when we know that the result of multiplication is going to be small positive integer, we only need to compute the rightmost digits, as we know that the remaining ones to the left are going to be an infinite chain of zeros. Now, how can we find 2-adic representation of any fraction? Or p-adic in general? The value of k gives us the length of a period, and the numbers of this form have a representation of mostly zeros, with 1 every k digits. This kind of number has a period k, with just a single 1 digit repeated over this period. The ones that have numerator smaller than denominator do not overlap with each other. We can therefore split a numerator into parts according to its positional representation, and the terms we get can be easily merged with each other. This demonstrates that negative fractions of such form (with denominator equal to for some k) have a periodic structure and the repeated pattern has the same digits as a representation of numerator (as long as it fits within the number of digits provided by the length of the period, which is true when numerator is smaller than denominator). If we have a denominator n that is not in such nice form, but at least is not divisible by p, we just need to find k such that is a multiple of n. As p and n are relatively prime, such k must exist (it follows from Chinese remainder theorem). In particular, when n is also a prime, such exponent may be quickly obtained with aid of Fermat's little theorem, which states that is then a multiple of n.
This is a Laurent-series-like representation, it has a digit corresponding to a negative power of 2. So the 2-adic representation of 1/5 (hex ...cccccccc) can be multiplied by any other number with a factor of 5 and we always get a whole number result. Can we also use that to check for divisibility by 5 by multiplying the result by 5 and see if it equals the original number? Edit: Of course not, we will get back the same result since 5 * 1/5. Doh. I'm not going to try this with the full 64-bits! 1/5 is an infinite sequence of digits: ...00110011001100110011001101. As for 2-adic ...CCCCCCCC, it is a representation of -4/5. Please wait while I update my above post with additional information how to convert various rational numbers to 2-adic forms. I have edited my long post above and added a section explaining how to obtain a 2-adic representation of any rational number. Because numbers that have denominator divisible by 2 have representations that include negative powers of 2, only fractions with an odd denominator can be used in the form of their low 32/64 digits for computations like yours. This is why to divide by 10 you have to use 1/5 and shift. As long as you know that your number is exactly divisible by an odd denominator, you can use the 2-adic reciprocal safely. It is not hard to prove that the low 32/64 bits of the result are then going to be correct (even for negative numbers!). I believe that even a simplified explanation that I provided here should be enough of a foundation for a proof. A bonus question: do you see a relation between this topic and the fact that x86 has "IMUL dest,src" but no "MUL dest,src"? So the following bit patterns for divisors should always give correct results. Not just these ones, it should work for any odd number. A 2-adic reciprocal of an odd integer is always a 2-adic integer (that is: a 2-adic number with no negative powers of 2). This is something that is normally proven with help of p-adic valuation, but since I already gave an exact algorithm for obtaining a 2-adic reciprocal of an odd number, analyzing this algorithm is enough to prove it. Not just these ones, it should work for any odd number. A 2-adic reciprocal of an odd integer is always a 2-adic integer (that is: a 2-adic number with no negative powers of 2). I meant for 32-bit integers. The period of the divisor needs to be a factor of 32 or we can't use it to find divisors unless we have 36-bit (or some other length) CPUs. Oh, that is you want to find divisor at run-time. But you are more likely to have the reciprocal value pre-computed and then this is should not be a concern. Also, I think there are other possible algorithms to obtain a 2-adic reciprocal. I have chosen this one because I believe it shows nicely various interactions and allows to quickly get a better grasp of what is going on with these patterns. Yes. I look for a programming usage from the discussion. So we know from above that 7 can't be used in this way on 32-bit CPUs. Which means that if I have a problem where I need to divide by 7 I already know I have to find some other method. Wait, why do you think you would not be able to divide by 7? If you cut it down to the lowest 32 bits, you get 0B6DB6DB7h. Please run your tests and see that as long as dividend is a multiple of 7, multiplication by this reciprocal gives the right result. A 2-adic reciprocal of any odd number, cut down to its lowest 32 digits, is going to work correctly for all 32-bit inputs divisible by that odd number. Oh, so the computation of the constant is different. I was thinking that it would be 2^32 * 6 / 7 = 0xDB6DB6DB (or 0xDB6DB6DC). I have shown the entire procedure in the second half of my edited post (I added that part later). was among the examples there. For denominator 9, you first need to find its multiple that has form . One that works is . This is the missing piece. We have to find the period first and then we can shift the result some number of bits to align the period with the bit 0. For 11: divisor = 1 + 2^(32 + period - 32 mod period) * 10 / 11 = 0x(E8)BA2E8BA3 Works. But it needs more than 32 bits to compute the value. However looking at the result we can just set the top bit manually and we get a working value.